"Sometimeslife seems like a mosaic that was torn from the wall and sits in pieces on the floor. Not mmy life in particular....Just Life. "The engineering genes that run in my family tell me what's wrong with the world. Of course, I didn't get the profitable ones[,] just that eye for what Should Be Different. The spiritual side sees what is creaative and good. The advocate sees the illness and heartbroken smile of someone who's always been left behind. "So this is me trying to piece it all together." Thank you for your consideration, Ms. Dignan. Hi Ms.Morrison: thanks so much for your email. It is always nice when I get kudos for my work, and it's specially nice when I hear how one of my pieces is so pertinent to someone else. 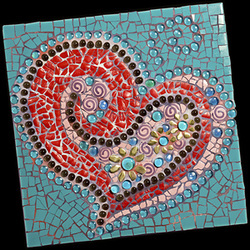 Yes, you may use the Bodacious Heart image, IF in addition to crediting me for making the mosaic, you would please add a "Photo by Anne Chadwick Williams" credit. ... Thanks for getting in touch.